Matthew J. Landry has been an associate with Blish & Cavanagh since July 2013. Prior to becoming an associate, he worked for the firm as a law clerk in 2012 providing litigation support. Mr. Landry's practice now includes civil litigation and land use matters. Before joining the firm, he was a summer law clerk for Plunkett Cooney, P.C. in Michigan, assisting attorneys in construction, consumer protection, and insurance defense cases. Mr. Landry earned his Bachelor's Degree from Johnson & Wales University in 2005. He was awarded his J.D. from Thomas. M. Cooley School of Law in 2012. In law school, he served on the Assistant Board of Editors of the Thomas M. Cooley Law Review and was a participant in mock trial and moot court competitions. 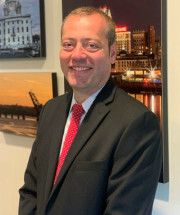 Mr. Landry is admitted to practice in Rhode Island and Massachusetts and is a member of the Rhode Island and Massachusetts Bar Assciations.